The beauty of Progressive music is the myriad of ways by which it may be approached by listeners and musicians alike. 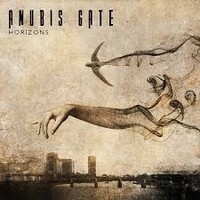 The Danish quartet ANUBIS GATE are soon to release their 6th album, “Horizons”, the first album without long-time members Morten Sørensen and Jesper M. Jensen, and doing well to stay with long-time producer Jacob Hansen. New members Morten Gade and Michael Bodin offer their exceptional instrumental skills in the mix. With “Horizons”, we see a continuation, albeit tangential, from the major turning point that was the self-titled album. With this release, one can expect the darkly melodic-melancholic and song-oriented Progressive music they have since become known for. As much as I loved the self-titled album, “Horizons” tops it in almost every way. “Never Like This” is exemplary of the band's ambitious, but inevitably excellent and evocative songwriting, that fuses liquid but hard-hitting riffs and airy, creative melodic work. Henrik expands his vocals here quite significantly, his immense range travelling from spectrum to spectrum and delivering catchy hooks in a deliciously Jazzy fashion. Coming from Pop roots, he offers something unique and tangible to the Metal table. “Hear My Call” is my favorite track here; I was instantly hooked, even months ago, hearing just snippets on teasers. A deceptively heavy, yet groovy intro riff, drives the majority of the song, with yet again a creative display of melodic progressions. The chorus is delightful, with Henrik showing a soaring facet to his vocal repertoire. Both guitarists possess a unique ability to seamlessly transcend between the heavy and melodic in an instant, which is sudden and followable at the same time. Of course, “A Dream Within A Dream” requires a mention; their longest track, at 14 minutes it even surpasses “The End of Millennium Road”, but similarly combines an array of amorphous soundscapes. It also continues a neat little trick I have noticed the band perform, where certain lyrical passages would link back to previous tracks; such occurred with “Ammonia Snow” on “The Detached”. The highlight is the delicious passage demonstrated on the recent teaser, displaying a symbiotic melody between Henrik's bass and his vocals. “Erasure” is a surprising and very enjoyable acoustic piece that garnishes the end of the album. As opposed to the ballad “Ammonia Snow”, this track features predominantly acoustic guitars and a dramatic crash of distorted electric that breaks up any potential monotony. Did I mention the hauntingly beautiful lyrics? It is repressively hard not to ramble on about Progressive music with such surreal, engaging properties. In the end, any expectations I had of this release were not met, but blown away. The year is young, but it is already in my proverbial, annual top 10.